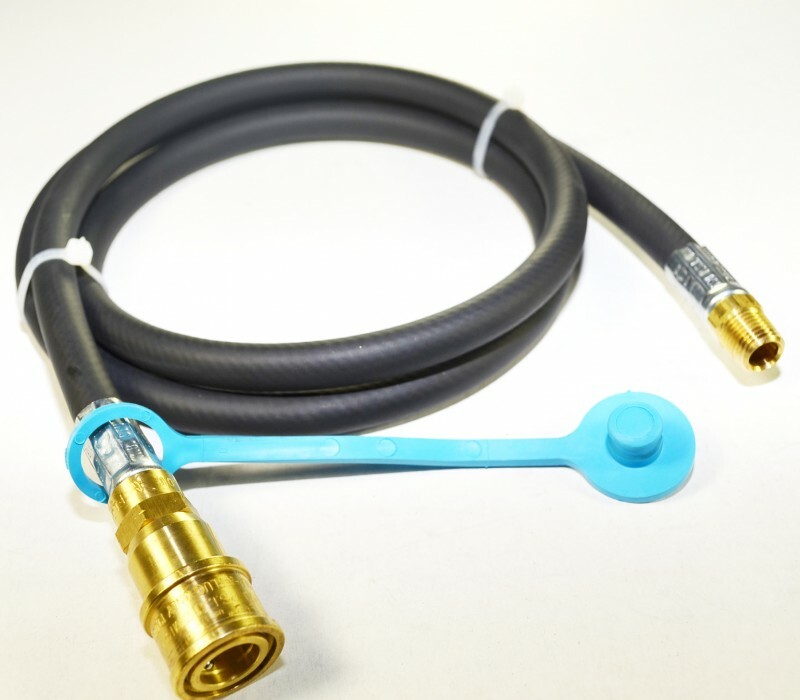 These combination gas quick connect hose sets make connecting and disconnecting to a propane gas tank easy! Note: If you have an existing quick connect socket, please check the inscription on the pull back sleeve to be sure you are buying the correct series of quick connects. If you are not sure if your quick connect is compatible please call (713) 222 6095. UL and CSA approved hoses and couplers automatically shut off the gas supply when disconnected and automatically turn on the gas supply when connected. Couple-Safe quick connect gas couplers will deliver high pressure propane (from a propane tank) with a maximum working pressure of the hose up to 350 psi. Working pressure of the coupling is 250 psi and is for use both on portable outdoor cooking appliances and stationary gas appliances like a barbecue grill. High Pressure Couple-Safe gas quick connect hose 5LPA plugs are compatible with the popular Hansen & Sturgis brand High Pressure gas quick disconnect model 5LPN QD socket. (These are 1/4" female socket couplers but are not interchangeable with the low pressure "Snap Tite" brand of model 250 gas quick connect 1/4" female socket couplers). 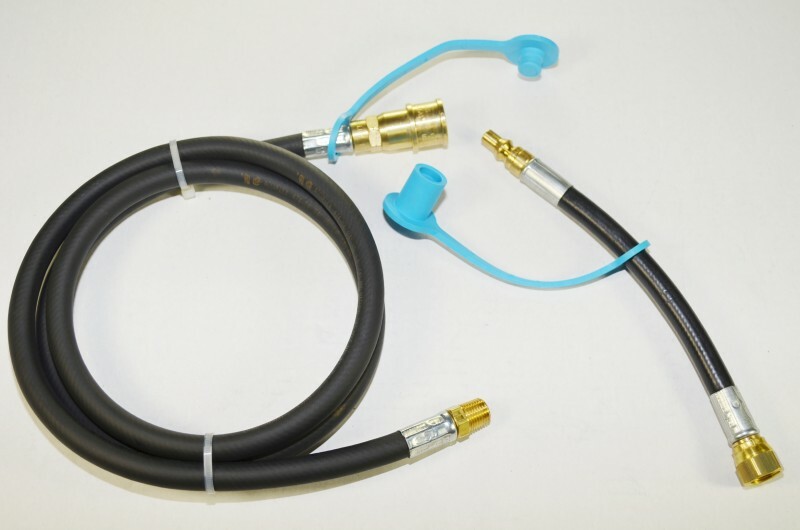 The Model 5LP Series hoses on this page are for high pressure and are not designed for use on low pressure propane outlets on RV's which generally have a model 250 female socket and are Low Pressure. If you have an RV or camper you will need the Model 250 Series LOW PRESSURE hoses and fittings highlighted in blue in the product listings below. Please check the numbers on the female socket to verify the correct fitting series, as it should indicate series 250. Contact us if you need help. Our PT9 "PIGTAIL" permanently attaches to any gas appliance and the longer QD hose permanently attaches to a high pressure propane gas regulator on the propane tank. This results in a safe setup. Connect the QD and PT9 together and the propane gas is turned on. The valve is inside the Sturgis Couple-Safe coupler. Disconnect the QD and PT9 and the propane gas is automatically cut off. All hoses we sell have been pressure tested with nitrogen at the factory. These M.B. Sturgis hose assemblies are compatible with ALL of our propane gas regulators. We will install any of these hoses on your choice of propane regulator assembly by request. Free shipping to the 48 contiguous U.S. States. for RV Low Pressure,3/8" Female Gas Flare x Model 250 QD Male Plug. ● Pressure classification of 1/2 PSI Max. ● Includes Dust Plug and Dust Cap. ● Available lengths in 6', 10', 11' and 12'. ● Not Suitable with 1/4" High Pressure Quick Disconnect fittings. from the RV socket than what is usually provided by RV suppliers. and when needed to connect to any QD gas supply hose. 1/4" Model 250 QD Male Plug x 1/4" Model 250 Female Socket. 3/8" Female Gas Flare x Model 250 QD Male Plug. ● For use with 100395 series QD hoses. We offer free shipping to 48 U.S. States. Wt. 4 oz. 1/4" Female NPT x Female Model 250 QD Socket. 1/4" Female NPT x Female Model 250 QD Ball Valve Socket. ● Total Length 2 1/2". We offer free shipping to 48 U.S. States. Wt. 5 oz. 1/4" Male NPT x Model 250 QD Male Plug. ● Total Length 1 1/2". We offer free shipping to 48 U.S. States. Wt. 1 oz. 2QDDC - 1/4" ID Dust Cap for Quick Disconnect Plug. ● The outside diameter of the Dust Cap cover is approximately 3/8". ● Plugs fit both High Pressure or Low Pressure 1/4" ID QD Male Plugs. ● Dust plugs colors may differ. ● This item does not qualify for returns or exchanges. 1/4" Male QD Plug or QD hose since one is already included. 2QDDP - 1/4" ID Dust Plug for Quick Disconnect Ball Valve Socket or Female Socket. ● The outside diameter of the Dust Plug insert is approximately 3/8". ● Plugs fit both High Pressure or Low Pressure 1/4" ID QD Sockets. 1/4" ID Hose or a Female QD Socket, since one is already included. which is a 9" Pigtail, 3/8" Female Gas Flare Swivel x 5LPN QD Male Plug. (Stainless Steel Overbraid QDC Hoses are available as the QDC-SS). ● Pressure classification of 250 PSI. ● Available lengths in 5', 10', 15', and 20'. the QDC to the regulator at no extra charge. ● Usually Not for Campers or RV's. ● Not Suitable for 1/4"ID Low Pressure Quick Disconnect fittings. the QD hose from the PT9 and the propane gas is automatically shut off. 1/4" Male NPT x 1/4" Female Model 5LPN Socket. (Stainless Steel Overbraid QD Hoses are available as the QD-SS). ● Not Suitable with 1/4"ID Low Pressure Quick Disconnect fittings. 3/8" Female Gas Flare Swivel x Model 5LPN QD Male Plug. (Stainless Steel Overbraid Pig Tail is available as the PT9-SS). Why use a Quick Disconnect Hose? The benefits of using a pigtail quick disconnect is that this keeps most of the torque from the weight and pull of the entire gas hose off the gas appliance connection. It distributes the "pull" along the entire length of the pigtail. If the quick disconnect fitting is nine inches further away from the appliance also makes it easier to connect and disconnnect the quick disconnect fittings. You could keep a pigtail on each of your gas appliances and quick connect them whenever needed. We offer free shipping to 48 U.S. States. Wt. 3 oz. 1/4" Female NPT x Female Model 5LPN QD Socket. ● Not Suitable with 1/4"ID Low Pressure Quick Disconnects. 1/4" Female NPT x Female Model 5LPN QD Ball Valve Socket. 1/4" Male NPT x Model 5LPN QD Male Adapter Plug. 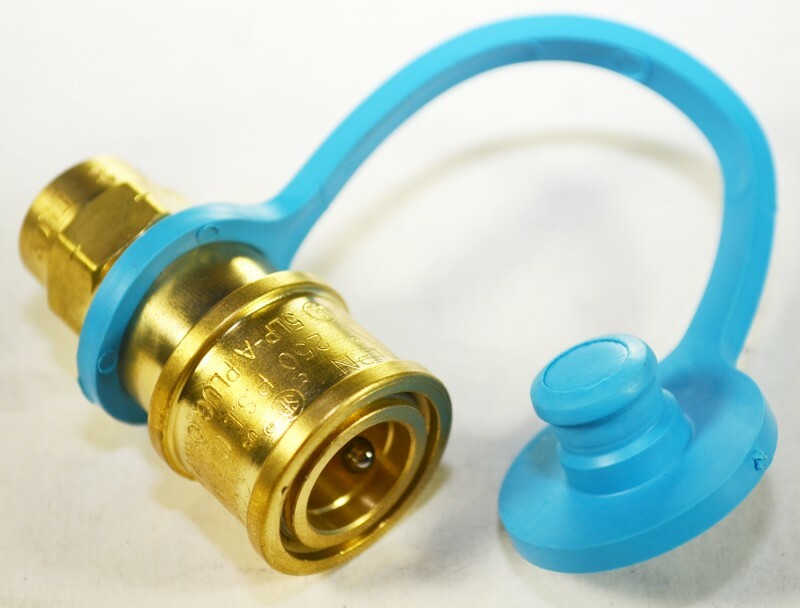 Sturgis couple-safe quick connect and disconnect gas hose couplers are compatible with Hansen gas quick connect and disconnect couplers and many other popular brands. They are not compatible with "Snap Tite" fittings.